SMAF-17 By Edwin Moriarty. Congratulations Edwin! 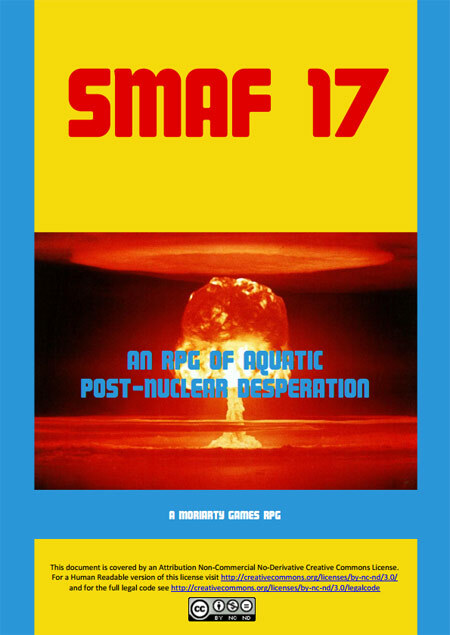 SMAF-17 is set in a submarine prison after the apocalypse. 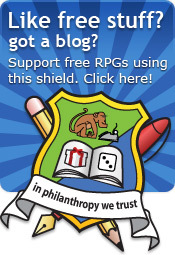 Filled will ex-inmates, prison guards, politicians and military personnel, you are a member of gang fighting for the last resources. The system is brave, has a tasty fudge-like core but also includes some wonderful insanity mechanics and a bidding process for initiative. The setting does a lot to fill your mind with plot possibilities and the whole game is written with a light and entertaining lilt. It could do with some more artwork and the layout is hard on the eyes in places but you have to keep reminding yourself that it was written in 24 hours. The Little Spaces competition was difficult. The aim of creating a whole game that entirely exists in a small space is very difficult. Edwin, the £30 Amazon gift voucher is yours. I'll be in touch via the 1KM1KT forum. Gosh, too many great ones to mention. With so many great games, you are forced to start being really tight about the requirements of the competition. You need to do that else you would never be able to choose between them. You pour over the judging criteria and discuss the merits of each. There were some of the games that would have won if it hadn't been about the confines of a Little Space. I'll cherry pick a few others and review them. And do a proper review of SMAF 17. Thank you to everyone who entered and all the kind words of support across the communities.